Park House — a three-story luxury condominium community situated between the Las Vegas Strip and the Summerlin shopping and entertainment hub — has put the finishing touches on an extensive renovation, emerging with a fresh, new look in its lobby and pool areas. Updates are now complete on all the community’s common areas, now appointed with new modern furnishings and bright pops of color, exuding a comfortable, yet contemporary, vibe. The pool area is equipped with new cabanas, furniture and umbrellas — all in vivid hues of turquoise and green, while the lobby now has plush transitional-style furniture — accentuated by bold abstract art and whimsical sculptures. 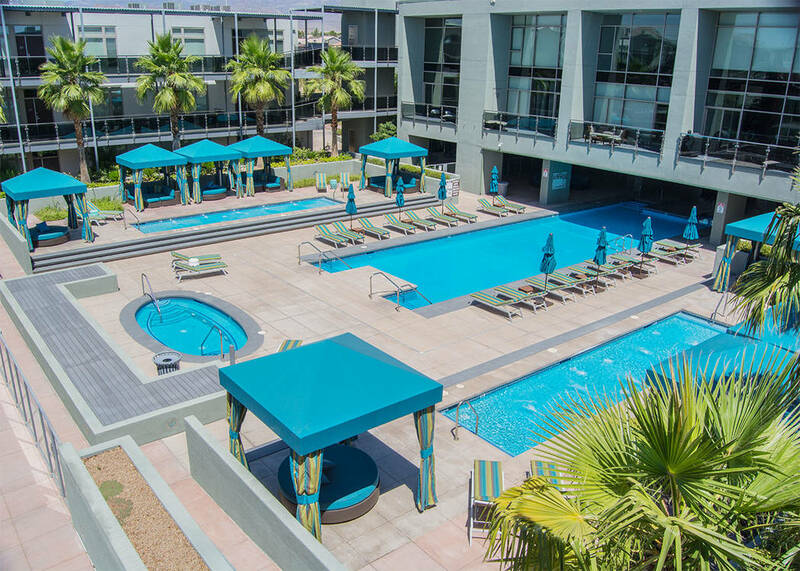 According to Brian Krueger, senior vice president at Coldwell Banker Premier Realty, Park House is one of the valley’s best-kept secrets. With the sun-splashed appeal of a posh, boutique-style hotel, the community offers an amenity-rich lifestyle with an expansive, 75-foot, resort-style swimming pool with cabanas, tanning pools and daybeds; a heated spa; state-of-the-art, private, two-story fitness/wellness center with yoga/Pilates level, overlooking the swimming pool, steam room and dry sauna; rooftop sundeck with a tasting kitchen; picnic area with barbecue stations and fire pits; a resident lounge with a pool table; shuffle board; big-screen TV viewing area and kitchen and underground controlled-accessed parking. Park House’s prime location allows residents to work, play, shop, explore and relax all in the same location — offering a true “lock and live” lifestyle. Park House is offering a limited collection of newly renovated luxury condominiums for sale. Some of the community’s most desirable residences — located with panoramas of the vibrant Vegas’ Strip or Spring Mountains — are available. With prices starting from $317,000s, Park House offers two-bedroom floor plans ranging from 1,541 square feet to 2,500 square feet. The condos feature designer finishes and high-end fixtures, including hardwood-style floors, walk-in closets, oversized soaking tubs, sleek, stainless-steel Kitchen Aid appliances, Quartzite and travertine countertops and a spacious, private patio or balcony. Large, open floor plans have great rooms and soaring 9½-foot-high ceilings, with private exterior front doors and massive gallery windows, giving each residence the feel of a spacious home. Residences also feature frameless walk-in master bathroom showers, custom cabinets with an additional handmade wine rack and built-in storage, European-style faucets and sleek single-basin kitchen sinks. Smart home touches include Nest thermostats, light-emitting diode lighting and dimmers throughout. Park House is at 8925 W. Flamingo Road. For sales information call 702-998-4118 or email sales@parkhouselv.com. Visit our website at www.parkhouselv.com.